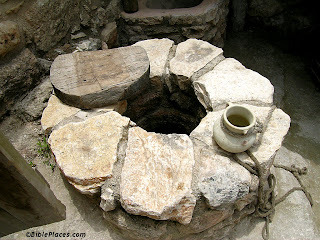 Each day we draw from one well or another and just like the woman at the well we seek to quench our physical, intellectual, and spiritual thirst from one source or another - whether the right or wrong wells. Jesus reminds us through His conversation with the Samaritan woman that our thirst cannot ultimately be quenched or satisfied apart from Him. The world would have us believe otherwise like the commercials that say "stay thirsty my friend" as they use that to try to get you to purchase more of their beverage - a beverage that wouldn't even quench ones physical thirst really! :-) All other sources or a cheap substitute to the real "Source" The Well that truly satisfies. We all need reminders of where we draw our strength from and we need to assess each day - "what well or wells am I drawing from today? I heard this great song appropriately named "The Well" by Casting Crowns and you can hear it via this Spotify link or another online source. I encourage you listen to this song, read John 4:7-14 and then assess where you are. You're either going to stay "thirsty" or you're going to find the right well and have your thirst quenched and we need to daily draw from the right well, the well that Jesus offers you and I! 1. Are you thirsty? Is your day-to-day life seemingly dry? 2. Whose well are you drawing from each day? 3. Who or Whose well should you be drawing from each day? 4. Do you think you can do life on your own without help from God and others? 5. What changes do you need to make today to drink from the right well?